Which Antarctica cruise is right for you? The MOST luxurious (5-star) – If you want to feel pampered during your trip to Antarctica, one of these cruises is your best option! Very Luxurious (5-star) – These cruises are also quite luxurious, but do not include quite as many amenities as the two listed above. Adventure Class (3-star to 4-star) – These cruises still offer a top-notch experience, but with smaller, simpler cabins and less luxury amenities. All Antarctica cruise ships are relatively small, and the experience onboard is quite different from cruising the Mediterranean or Caribbean onboard a traditional cruise ship that accommodates thousands of passengers. The smallest Antarcica cruise ship we offer has a capacity for 54 passengers, and the largest accommodates 200 passengers. One thing to keep in mind when choosing a boat is that according to IAATO (International Association of Antarctica Tour Operators) rules, only 100 passengers are allowed ashore at a time in Antarctica. However, on ships with a capacity between 100 and about 130 passengers, this is not typcially an issue as there are always some passengers who choose not to go ashore, and often also a contingent that is either kayaking or zodiac cruising while others are ashore. Antarctica cruises range in length from 6 days to 20+ days. A 6-day cruise will cruise across the Drake Passage to reach the Seventh Continent and then return to South America by flying from King George Island to Punta Arenas, Chile (or vice versa). The majority of the 6-day cruise is spent at sea with only one afternoon and one morning spent in Antarctica at King George Island, so we only recommend this option for those who merely want to set foot in Antarctica without seeing much or covering much ground while there. Most Antarctic Peninsula cruises are between 10 and 12 days long, with 4 days spent crossing the Drake Passage. The first day of the cruise is embarkation and usually starts late in the afternoon, while the last day of the cruise is disembarkation, exiting the ship after breakfast. With this in mind, a 10-day cruise will spend 4 full days in Antarctica, while an 11-day cruise will spend 5 days at the Frozen Continent. There are also some voyages that travel farther south than most, endeavoring to cross the Antarctic Circle at 66 degrees South. These are usually around 14 days long. The longer cruises (16 to 20+ days) will include the Falkland Islands, South Georgia Island, and Antarctica, or a combination of two of these destinations. There are also a handful of voyages that focus solely on South Georgia or solely on the Falklands. The most easily accessible part of Antarctica, the Antarctic Peninsula and South Shetland Islands, is located about 610 miles (980 km) south of Cape Horn, the most southerly point of South America. The waters between South America and the Antarctic Peninsula are known as the Drake Passage. The Peninsula is dotted with research stations governed by various nations and there are many disputed and overlapping claims of sovereignty made by Argentina, Chile, and the United Kingdom. However, the Antarctic Treaty System states that no one nation has dominion over any part of Antarcica, so these countries do not attempt to enforce their claims. The coasts of the Peninsula have the mildest climate in Antarctica with moss and lichen-covered rocks free from snow and ice during the summer months. Antarctic krill are found in the waters surrounding the Peninsula, making the seas rich feeding grounds for penguins and marine mammals. Penguin species found in abundance at the Peninsula include Gentoos, Adelies, and Chinstraps. There are also a couple small colonies of Emperor penguins located on islands off the coast of the Peninsula. To see the Emperors, you must venture to the interiors of these islands, as they do not have colonies on the coast like the other penguins. 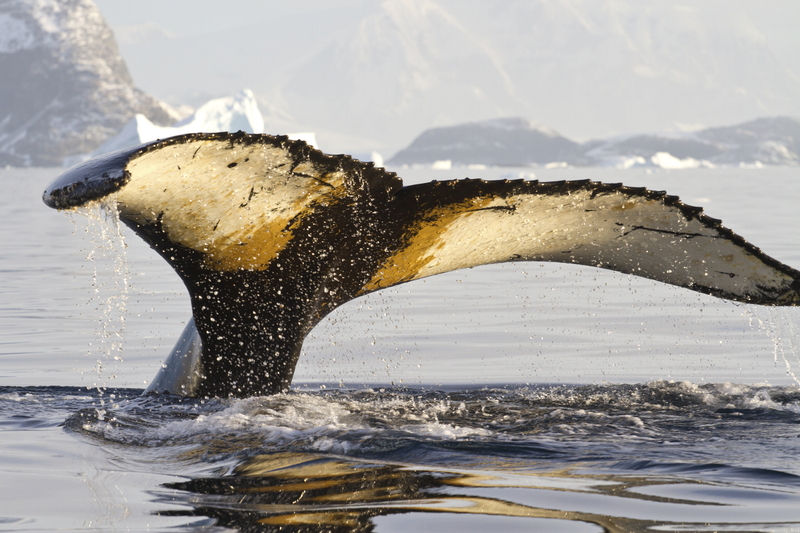 Marine mammals seen at the Peninsula are Crabeater seals, Weddell seals, Leopard seals, as well as various whale species such as Humpbacks, Minkes, and Orcas. In the skies watch for skuas, petrels, shags, and the beautiful Antarctic tern. The stunning landscape of the Antarctic Peninsula is dominated by soaring peaks, considered a continuation of the Andes, as well as massive glaciers spilling into the iceberg-dotted sea. The highest peak is Mount Jackson at 10,446 ft or 3,184 m. Most tourist vessels hug the western side of the Antarctic Peninsula passing through areas such as the Bransfield Strait, Gerlache Strait, Neumeyer Channel, and the famous Lemaire Channel, known as “Kodak Alley” for its spectacular scenery. A few cruises will also venture to the lesser-visited eastern side of the Peninsula, known as the Weddell Sea, but extensive pack ice on this side can make it difficult for ships to navigate its waters. A territory of the United Kingdom, the sub-Antarctic island of South Georgia is a unique place, rich with wildlife and history. It is positioned in the southern Atlantic near the Antarctic Convergence where the cold Antarctic waters and the warmer waters to the north collide, creating a bounty of krill for the island’s mammals to feed on. South Georgia boasts one of the largest breeding populations of King pengins in the world, with over 100,000 breeding pairs. At about 3 feet tall, Kings are the second largest penguin species in the world (after the Emperor), and it is truly a spectacular site to see a colony of thousands of King penguins with the jagged peaks and glaciers of South Georgia as a backdrop. South Georgia is also home to colonies of Macaroni penguins, Gentoo peguins, and Chinstrap penguins. Other bird species include petrels, prions, shags, skuas, gulls and terns. Marine mammals are also abundant residents at South Georgia, with beaches dominated by both the small quick Antarctic Fur seal and the enormous Elephant seal. Whales surround the island, with Southern Right whales, Humpbacks, and Fin whales being the most frequent vistors. It is also possible to spot Orcas, Sperm whales, and Blue whales. In addition to its striking landscape of snow-capped peaks (the highest is Mount Paget at 9,629 ft or 2,935 m) and its abundant wildlife, South Georgia also has a rich history. It was often a stop-off for explorers on their way to Antarctica, and Shackleton’s famous Endurance expedition ended here after he and 5 others crossed from Elephant Island in the South Shetlands all the way to South Georgia in a tiny lifeboat. Shackleton is buried on the island and most cruises that visit make a pilgrimage to his grave. Aside from explorer history, there is also ample whaling history on the island, which was an active whaling hub from the early 1900s all the way through the 60s. Visitors can view this history firsthand at Grytviken, a whaling station that has been extensively cleaned to remove hazardous materials. Today it contains a lot of the original structures and equipment, including the famous restored Norwegian Luthern Church. There is also a museum and a small shop. Located about 300 miles east of Argentina in the southern Atlantic, the Falklands are an archipelago comprised of more than 770 islands, with the two primary islands being East Falkland and West Falkland. The Falklands are perhaps most famous for the war fought over the islands’ sovereignty in the early 1980s. The British have had control of the islands since 1833, but in 1982 the Argentine army invaded during the Falklands War, which lasted for two months and ended with Great Britain’s victory. Today Argentina still claims to be the rightful owner of the Falklands and calls the islands Las Malvinas. About 3000 people, all British citizens, inhabit the Falklands. In fact, a stroll down the street in the archipelago’s capital, Stanley, feels like a stroll through a quaint English village, except that all the vehicles you see are land rovers, ideal for the islands’ rugged terrain and limited roads. Most of the islands’ residents are farmers and much of the land is used as pasture for grazing sheep. There are no native trees in the Falklands, and the wind-scoured craggy landscape is dominated by tussock grass. Cruises that visit the Falklands typically spend two days in the islands, and almost always include a visit to Stanley. The islands are rich with birdlife with over 200 species present, including caracaras, geese, herons, egrets, and petrels. There are large colonies of Black-browed albatross, with 80% of the world’s population breeding in the Falklands. Penguin species present in the islands are Southern Rockhopper penguins, Magellanic penguins, King penguins, Gentoo penguins, and Macaroni penguins. About two thirds of the Southern Rockhopper penguins in the world breed here, so a visit to the archipelago usually includes encounters with the nimble and comical Rockhoppers. The waters around the islands are also frequented by marine mammals, such as Elephant seals, South American fur seals, and various cetaceans. There is a popular misconception that passengers cannot even get off the ship on an Antarctica cruise. All the Antarctica cruises Southern Explorations offers include as many landings as possible while at the Antarctic Peninsula. Generally one landing of 2 to 5 hours is made in the morning and then another landing of the same length in the afternoon. Of course, excursions are always subject to weather conditions, but even if the staff deems it unsafe to visit one site, they will make sure to find an equally interesting alternate landing. All cruises include zodiac cruises to observe marine mammals and stunning iceberg formations, as well as shore excursions, during which you walk around on land and observe penguins and other wildlife. In addition to these two activities, many cruises offer more active options for Antarctica exploration. The most commonly offered additional activities are kayaking and overnight camping, usually incurring a supplementary fee to participate. There are also a handful of cruises that offer more extensive activities, such as scuba diving, backcountry skiing, snowshoeing, and mountaineering. When choosing an Antarctica cruise, it is important to consider which activities you want to participate in during your trip to the White Continent. This will help narrow down the choices. On a traditional Antarctica cruise you board the ship in Ushuaia, Argentina and cross the Drake Passage onboard the vessel on the way down to Antarctica and then again on the way back (2 days in the open ocean each way). For those who cannot stomach the idea of crossing the Drake Passage onboard the ship (see FAQs for more details about the Drake) or who want a quick trip to the Seventh Continent, a fly cruise is a good option. Fly cruises involve flying roundtrip from Punta Arenas, Chile to King George Island in Antarctica. Once the plane lands on King George Island, you board your ship and cruise onboard during your time in Antarctica, before returning to King George to catch the flight back to Punta Arenas. There are also some Antarctica itineraries that involve flying to Antarctica on the way there and cruising on the way back, or vice versa. This can be a nice option for those who want to experience both modes of reaching Antarctica. Since this kind of itinerary generally starts in Ushuaia, Argentina and ends in Punta Arenas, Chile (or vice versa) it can also be a good way to connect between the Argentine and Chilean sides of Patagonia pre-cruise and post-cruise. Unlike most penguin species colonies, Emperor penguin colonies cannot be found close to shore. These birds breed far inland on the pack ice of Antarctica, so spotting them can be challenging for humans. On most cruises, you are very unlikely to see any Emperors unless there happen to be a few out fishing in the waters off the coast of the Antarctic Peninsula. 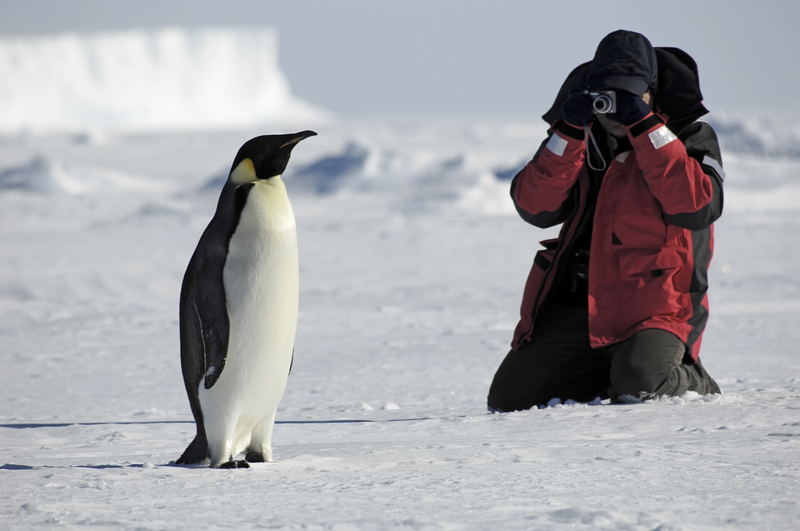 If you want to see Emperor penguins during your trip to Antarctica, the best option is one of the special Emperor penguin departures, which always occur in late November or early December. These trips involve traveling to the White Continent on a ship equipped with helicopters, which are used to travel inland where the Emperors, largest of all penguins, can be found nesting.